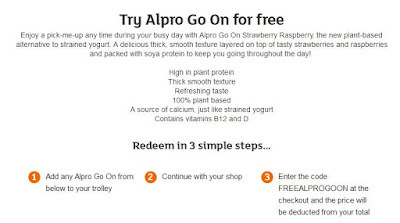 The Vegan Magpie: Alpro Go On Go On Go On Offer! Alpro Go On Go On Go On Offer! Hello! Sainsbury's have an excellent online offer at the moment! For 15,555 customers (odd number that!) 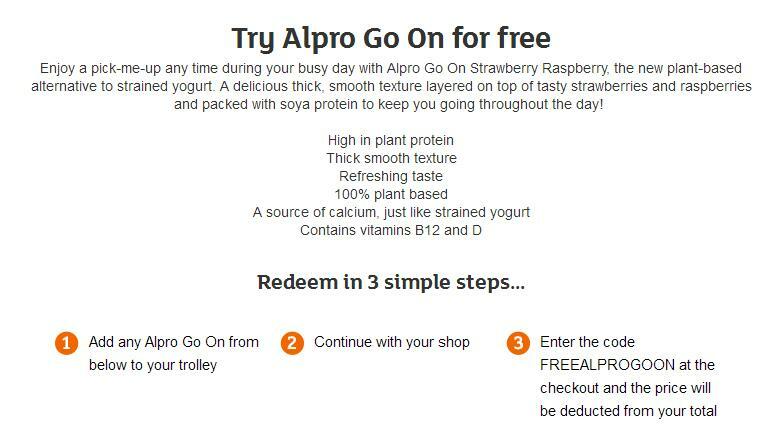 if you do an online shop with Sainsbury's you can add an Alpro Go On strawberry and raspberry flavour to your basket, then at the checkout add the code 'FREEALPROGOON' and you get the Go On absolutely FREE!! This offer ends either when all 15,555 are claimed, or on 18th July, whichever comes sooner. It can't be used with any other offer for the Go On. One per household. Also don't forget it's online only! So if you're doing an online shop anyway, it's well worth it. Whilst there, it's also worth looking at sites such as https://www.vouchercodes.co.uk/sainsburys.co.uk and Sainsbury's own website https://goo.gl/zaZa8E for extra offers, particularly if it's your first shop! Holland and Barrett Vita coco coconut oil offer! Yet another awesome Vegusto offer! Ms Cupcake postal goods offer! Vegan Tuck Box summer sale!